Nature-based approached are often more cost-effective in the long term than purely technical approaches and can produce important additional socio-economic benefits for the environment, citizens, and the local economy. Climate change is a global phenomenon that poses risks to sectors across society and the economy. Nature-based approaches can offer sustainable solutions to cope with climate change mitigation and adaptation challenges. 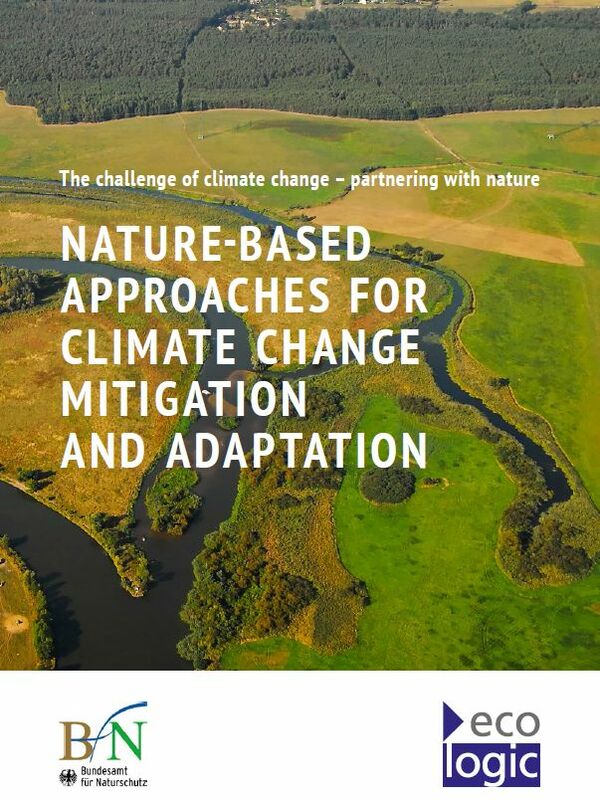 The brochure "Nature-based approaches to climate change mitigation and adaptation", developed by Ecologic Institute on behalf of the German Federal Agency for Nature Conservation (BfN), introduces the opportunities, challenges, and success factors of nature-based solutions and presents good practice examples. The brochure is available for download. In nature-based climate change mitigation, ecosystem services are used to reduce greenhouse gas emissions and to conserve and expand carbon sinks. In nature-based climate adaptation, the goal is to preserve ecosystem services that are necessary for human life in the face of climate change and to reduce the impact of anticipated negative effects of climate change (e.g. more intense rainfall, more frequent floods as well as heat waves and droughts). Both approaches seek to increase the resilience of ecosystems and thereby to stabilize the provisioning of important services including for example coastal and flood protection, soil fertility, air quality, carbon storage, and aesthetically beautiful landscapes. Compared to technology-based solutions to climate challenges, nature-based solutions are often lower cost, longer lasting, and have multiple synergistic benefits for a variety of sectors and political goals. The brochure outlines the multifaceted advantages of nature-based solutions, and explores issues such as project planning and financing. Five good practice examples from German speaking countries of varying sizes involving different sectors, geographic areas, ecosystems, and actors are highlighted. Success factors for planning and implementation are identified, and opportunities for action for organizations, administrators, and individuals are explored. The brochure also contains links and contacts for further information on nature-based approaches as well as project funding and support. The brochure is available for Download in English and German. Naumann, Sandra; Timo Kaphengst; Keighley McFarland and Jutta Stadler 2014: Nature-based approaches for climate change mitigation and adaptation. The challenges of climate change - partnering with nature. German Federal Agency for Nature Conservation (BfN), Ecologic Institute, Bonn.